The standard F-PACE all-wheel-drive system uses Intelligent Driveline Dynamics software for agile handling and to minimize understeer. The F-PACE always drives, feels and handles like a Jaguar. Shared with F-TYPE, the 3.0-liter V6 supercharged engine is available in both 340hp and 380hp versions, delivering instant access to high levels of performance and torque at all engine speeds, as well as refinement. The new 380hp engine is capable of 0-60 mph in 5.1 seconds. The F-PACE is fitted with eight-speed automatic transmission that is both highly responsive and smooth. Developed specifically for the demands of a performance vehicle, it delivers rapid shifting for effortless acceleration and overtaking. You can also manually control gearshifts via the steering wheel paddles at the touch of a finger. Torque Vectoring by Braking (TVbB) maximizes control through the tightest corners. Torque Vectoring technology provides controlled braking to the inside rear delivering outstanding sports car agility and added driver confidence. 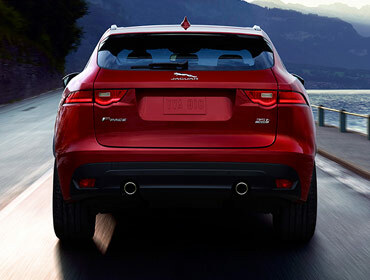 Pronounced rear haunches enhance its sporty character inspired by F-TYPE, and form a seductive backdrop for high intensity LED taillights of the F-PACE. The proportions of the F-PACE support a low drag coefficient of 0.37 (V6 engines). The result is that the F-PACE really is as sleek as it looks. Highly advanced aerodynamics increase downforce. This helps reduce fuel consumption and wind noise while adding to high-speed stability and driver confidence. 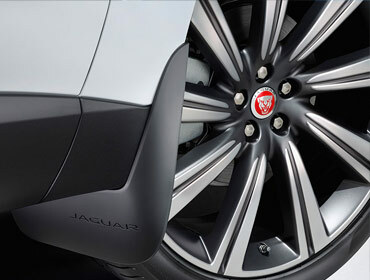 The F-PACE offers an extensive choice of lightweight, aerodynamically efficient alloy wheels, as large as 22” in diameter - the perfect complement to its dynamic look. Choose your wheels with our configurator. Superb sound systems bring your music to life. The Meridian™ 380W Sound System provides acoustic range through 11 speakers. The optional Meridian™ 825W Surround Sound System offers more breadth of performance. All systems ensure that everyone will enjoy a rich, enveloping audio experience. You can take personalization to the next level with optional Configurable Interior Mood Lighting. The system highlights the finest interior design details with soft pools of light in a choice of ten different colors. The F-PACE can create an ambience to match your every mood. 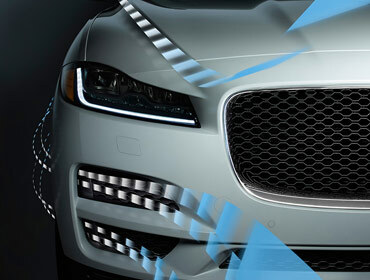 Focus on the road with an advanced Head-Up Display (HUD) system using laser technology. This optional state-of-the art system projects a range of important information onto the windshield. Remaining clear even in direct sunlight, the crisp, bright image can display vehicle speed, navigation, cruise control notifications, Forward Alert and Traffic Sign Recognition data, where available. The next-generation hardware and software of InControl Touch Pro™ advances connectivity and entertainment to the very highest level. Its features replace or enhance those found in InControl Touch. Available Park Assist makes parking in tight spaces stress free. Sensors around the car measure the space and, if suitable, will enable F-PACE to accurately steer itself during both parallel and perpendicular parking maneuvers - the driver only has to control the brakes and accelerator. In case of parallel parking, the system can also steer the vehicle out again. The available Autonomous Emergency Braking system utilizes a forward facing camera to watch for a potential collision. If one is detected, F-PACE gives an audible forward collision warning. Visual warnings in the Head-Up Display (if fitted) and instrument cluster follow. If no action is taken, with a collision still anticipated, the system is designed to apply the brakes to help reduce the severity of a possible impact. The optional Surround Camera System gives you 360 degree vision from 4 cameras, shown on the central Touchscreen. This helps with various maneuvers from parking by a curb, getting in and out of tight spaces and backing up. You can choose from pre-set features like curb view, rear side view or 360 degree view. Blind Spot Monitor alerts you of vehicles in your blind spot via an icon displayed in the door mirrors. Building on the benefits of blind spot monitoring, the Closing Vehicle Sensing system uses radar sensors to alert the driver to the presence of vehicles approaching fast from behind when changing lanes by displaying a flashing icon in the corner of the side mirrors.